One of the most interested observers on Dec. 29 when Jon Jones and Alexander Gustafsson go to battle for the light heavyweight title at UFC 232 will be Anthony Smith. A former middleweight turned 205-pound contender, Smith snagged a top spot in the UFC’s light heavyweight rankings following his UFC Moncton victory over Volkan Oezdemir. 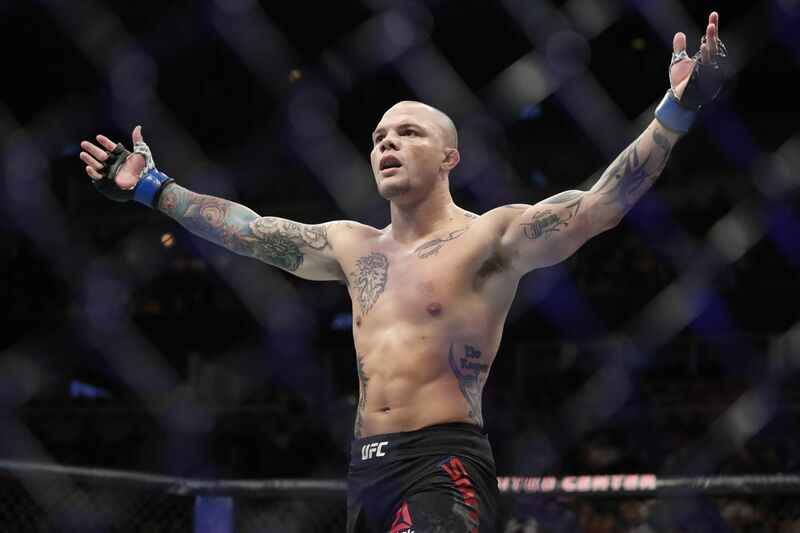 With his three-fight streak of vicious stoppages over the likes of Oezdemir, Mauricio Rua, and Rashad Evans in tow, “Lionheart” is now positioned to potentially challenge for the next 205-pound title shot, and he made his desire to fight Jones known after his success over the division’s previously No. 2 ranked contender in Moncton. But Jones still has plenty of work ahead of him at UFC 232. Back in 2013, Gustafsson gave Jones all he could handle at UFC 165, however “Bones” pushed through the toughest adversity of his career to ultimately defeat the Swede via unanimous decision. So does Smith think history will repeat itself and Jones will best Gustafsson for a second time at UFC 232? “I do,” Smith said recently on The MMA Hour. “I think it’s going to be a very similar fight, but I think Jon Jones is one of those guys that — I think that one of his biggest advantages is that his fight IQ is super high, so I think that if he has 25 minutes to figure you out, another 25 minutes isn’t going to be beneficial to you. “I think that if Jon Jones is being truthful when he said he didn’t train that hard for the first fight [at UFC 165], I would imagine him coming off this long layoff, with everything that’s happened to him — that the best Jon Jones is going to show up, and I think that that’s what he’s going to need to beat Gustafsson,” Smith added. Smith, 30, has spoken openly about his desire to challenge Jones next. He said on The MMA Hour that if he had a choice, he would choose to fight Jones over Gustafsson or the UFC’s current light heavyweight champion, Daniel Cormier, who is expected to be stripped of his title at UFC 232. Even before his Oezdemir win, Smith voiced a firm belief that he was capable of beating Jones, and he doubled down on that belief on the show, stating that other than himself and Gustafsson, he doesn’t see any potential challengers in the 205-pound division who have a real chance at handing Jones the first legitimate loss of his MMA career. The fact that Smith is even in the conversation among the 205-pound elite is an incredible story unto itself. A longtime journeyman at middleweight, “Lionheart” began to turn his career around in 2013 with the start of a run that has since seen him win 14 of his last 16 fights. The last three of those fights have been the most impressive — since moving up to 205 pounds, Smith has quickly established himself as a world-class contender with a string of destructive victories, culminating in his come-from-behind win over Oezdemir. An eternal underdog, Smith was the betting underdog against Oezdemir, but he persevered through early trouble and found a way to get it done at UFC Moncton. “I’m just really proud of myself,” Smith said. “I fought really, really hard, and Volkan’s a lot better than people give him credit for. I know that everyone kinda labels him the one-punch knockout guy, but you see in there his ground control was really good when he was on top in that turtle position, he forced me to stay safe and not be able to kinda explode there. And he’s a lot more technical on his feet, actually, than I expected. I kind of expected him just to be kinda the wild brawler, but he’s a lot better than people give him credit for. In a way, his current run to 205-pound title contention has validated everything that Smith knew to be true about himself during the dark days in his career. So even though his ultimate goal is still unmet, Smith is proud of what he has accomplished thus far.